A CEREC restoration is a CAD/CAM (computer aided design & manufacturing) that is custom made for the patient right here in our office. -One visit dental restorations, which saves the patient travel time. -An extremely strong and natural looking restoration that should last many years. -A bigger fracture/breakage of part of the tooth due to trauma, previous decay, unsupported previous fillings, or biting into a very hard object that cannot be partially covered due to the amount of tooth structure that is missing. It takes only one appointment to restore your tooth with a CEREC crown/bridge restoration. That is because the restoration is custom crafted with our CAD/CAM system right here in the office. First Visit: We start with a digital X-ray of the tooth to make sure that no infection is at the end of the root before we construct the crown. Sometimes abscesses are in the tooth and the patient does not know it. We, of course, will thoroughly “numb” you up with local anesthetic to make you comfortable. We use the “Dentalvibe” system, which helps block injection pain. 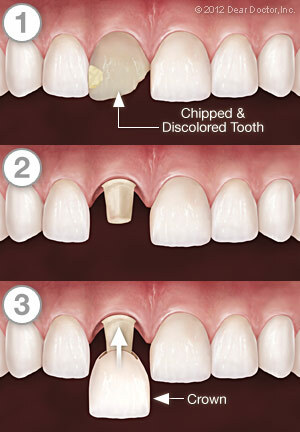 We then remove any restorative material, decay, chalky demineralized tooth so that we are at sound tooth structure. The crown build up or core, if required, is next and is bonded physically and chemically to the tooth. This material strengthens the tooth, decreases sensitivity, and releases fluoride into the area to decrease the chance of new decay under the crown. 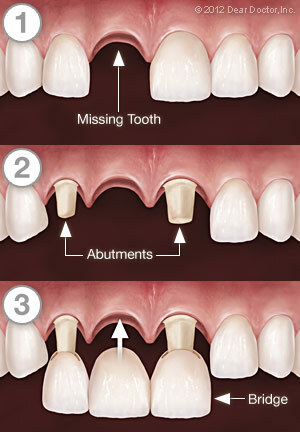 The tooth is then shaped so that the restoration fits over/in/around the remaining tooth. A final optical scan of the prepared tooth is taken. The restoration is then designed on the computer and this information is sent digitally to the milling unit in our in-house dental lab. That same day we bond the restoration in your mouth with composite bonding technology. Here at Dr. Wiest’s office, we care about our patients and want them to have a good experience with us. If for any reason the CEREC crown we made for you breaks or fractures we will replace it FREE of charge as long as we see you every 6 months for a preventative cleaning and check-up. A CEREC crown/bridge is made out of a solid block of ideally manufactured porcelain and has been proven by over 20 years of clinical research to last many years. Six Month Smiles is for adults with crocked, spaced or misaligned teeth. Using clear braces to gently straighten and align teeth, the average time most people wear braces is just six months. It has quick results because they only move the teeth that show when you smile. Six months is the average treatment time. Most patients finish right around six months, but treatment times may range from 4-9 months. As with all orthodontic treatment, a retainer is necessary to maintain the new, straight position of your teeth. There are a variety of retainer options you can choose from depending on your personal preference and situation. Many insurance plans will cover orthodontics. For those without insurance, Dr. Wiest’s office offers a 10% discount if paid in full at the beginning of service. We also offer monthly payment plans, with the final payment due at the time the bands are removed. Everyone should be able to smile with confidence! For more information on crowns and bridges call our Provo, UT office at (801) 374-8205 today!